The record heat in October and November finally did in the Australian tree fern that I’d been nursing. The plant grows in full sun in its native environment, and was supposed to be able to survive full sun in coastal California. But two months of the hottest and driest weather this past year took care of what little will to live the plant had left. The fern served as a focal point in the garden, and its passing left a big void and a sad stick of dead trunk. It doesn’t help that the neighbor’s basketball backboard lines up almost perfectly with the dead trunk. We toyed briefly with training a small vine up the dead trunk, celebrating life and death and renewal and all that, but we couldn’t think of something that would look great as the main focal point of the space. So we were faced with coming up with a suitable replacement. The tree should max out in the 12-20 foot range and be not too broad–There’s a young tangerine tree nearby that we wouldn’t want to shade. Some plants immediately nearby would appreciate some shade, but others are quite happy with close to full sun; a tree that could be trained to have an open branch structure would work well. Something with a graceful natural form would be terrific–no big green popsicle-looking shade trees, please. The plant should be pretty easy to find locally, and couldn’t cost too much. This being drought-prone California, a tree that would be able to get by with much lower water requirements than original the tree fern would be a must. The “look” of the tree would have to complement Mediterranean, tropical or just plain odd-looking plants. Though not an absolute requirement, a native plant would be nice. The short list came down to four trees or large shrubs. Pros: Both John and I have always loved ginkgos, particularly their distinctive foliage and incendiary yellow autumn coloration. And their history of being a living fossil is cool. There are strains that range from little round shrubs to massive shade trees, with a couple options in the 12-20 foot range that could be trained with multiple trunks. Though not desert plants, they can make do with fairly low amounts of water. Cons: Availability, mostly. Local sources carry the itty bitty bonsai-friendly subjects or the big shade trees, nothing in between. The tree grows really slowly, so getting a specimen of the small varieties would be a challenge. The final look of the plant, too, might not be perfect for the location. Pros: Striking dark dark dark purple (almost black) leaves, and a neat weeping habit. The bark is shaggy and attractive. Rapid growth to its target size. Drought tolerant. Cons: The plant seems to develop a dense shade-tree look as it matures–maybe too dense for the spot. The literature says this form only gets to sixteen feet or so, but it’s only been around for a decade. Call me distrustful, but I’m just suspicious that it could be more maintenance than I want to sign up for to keep it small. Mature trunks seem large in scale to the plant. There’s a bamboo nearby, and it might be just too much wispy, willowy foliage. Pros:Several clones are available locally in boxed specimen size for not too much money–instant gratification! Gorgeous summertime flowers. Interesting exfoliating bark. The fauriei hybrids resist mildew better than the pure species. Cons: Their colors would look really similar to a pair of nearby bougainvilleas. The rigid forms of the trees would definitely pull the garden in a formal Mediterranean direction. Pros: Perfect eventual size (ca. 15 feet). Fairly fast-growing for a manzanita (though no speed demon). Dramatic red-brown stems with large light green leaves. 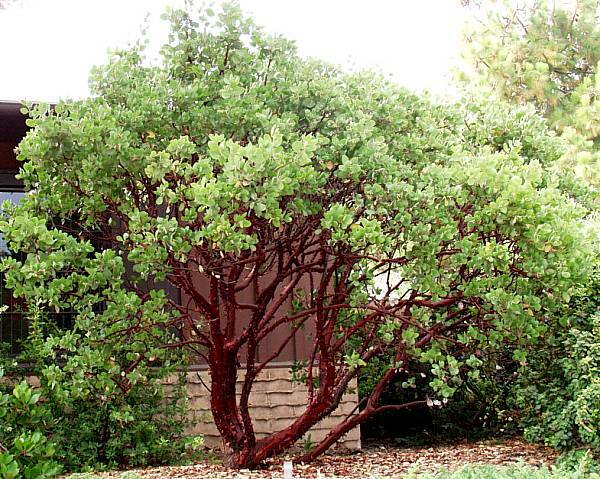 Drought-tolerant, but also more tolerant of garden water than most manzanitas. Flowers in the winter. Cons: Sporadic availability locally, and possibly only in small sizes. I’m worried that the spot might be just a little over-wet for even this manzanita.